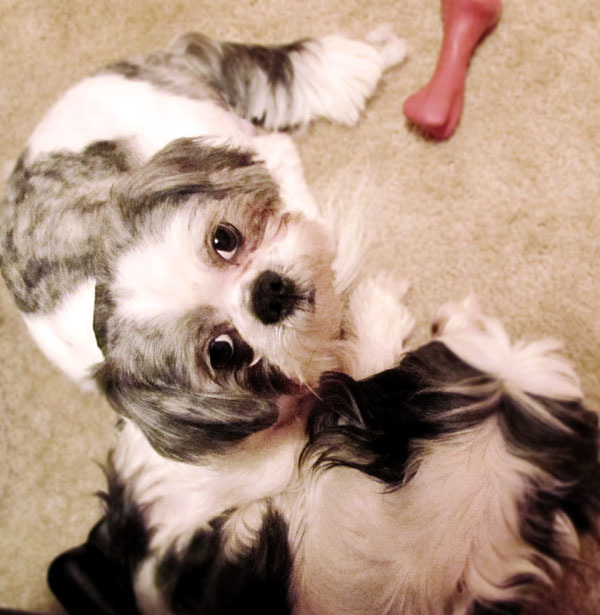 Mama really loves having Chanh, the Shih Tzu, stay with us this week. Although I hate that the attention is off me – the star of this blog, and the # 1 person in her heart – I do like Chanh, too. He’s loads of fun to play with. 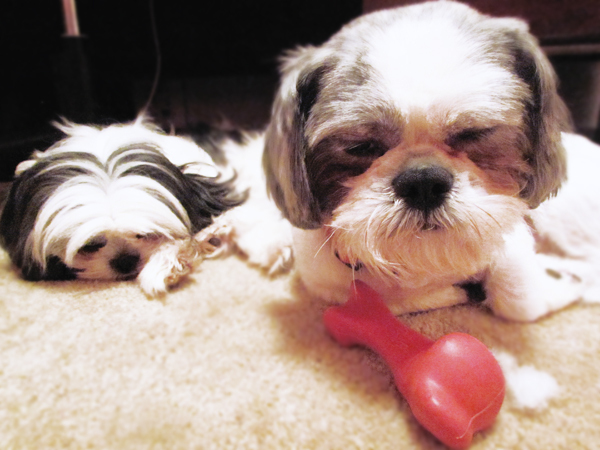 Plus, Two Shih Tzu is better than one. On the bright side, Mama still pays me lots and lots of attention. 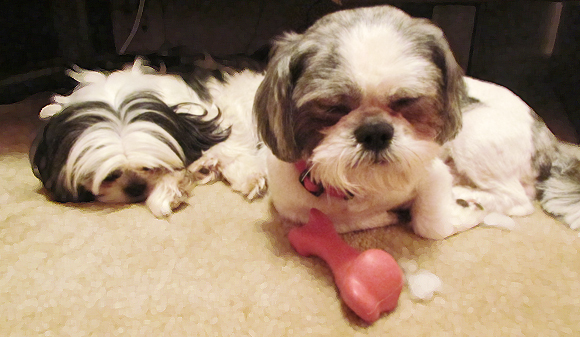 So, it’s not like she’s ignoring me for the other Shih Tzu. What she thinks is super cool is that when I don’t feel like cuddling, Chanh does. And sometimes, we both want attention at the same time . . . which means we have to share Mama’s lap. 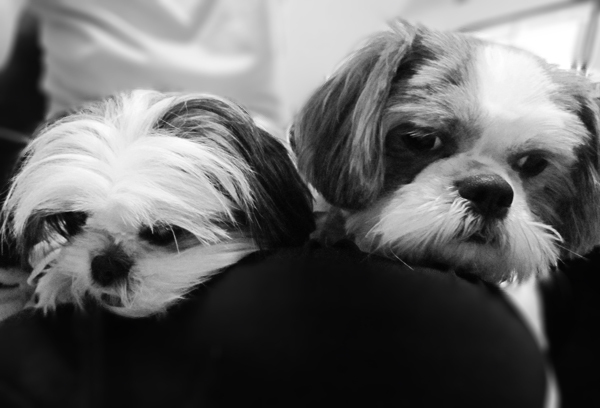 Two Shih Tzus sharing the lap of a 90-lb writer gal. I don’t think I really mind sharing, or else I would have barked my head off and told him to get off. Chanh and I actually love to be near each other. Mama has even caught him licking my face a few times, and I’ve licked his face, too. When Mama is busy, I will sleep by her computer chair, and so will Chanh. How sweet is that? Isn’t he a handsome Shih Tzu? Sometimes he sleeps with one eye open, which is weird. Hey Gracie, I was wondering how you guys could keep your beards clean. I’m having a hard time cleaning up Buchi’s fur near the eyes and I was hoping there was an easier solution than just rubbing it with a wet cloth. Our beards may be clean in the photos, but they are usually stained from mud or just drinking water. Mama has found that giving us bottled water, or filtered water helps with the staining on the beards. They also have little water bottles where you can lick the water out, and that also helps prevent staining. For the staining around the eyes, Angel Eyes can help, and cutting hair away from the eyes so that it doesn’t irritate it can also help. Also, make sure that Buchi doesn’t eat any grain products in his food, as that can also cause staining. hope that helps. Several seniors here have a Shih Tzu that they walk regularly. They do not get far without being stopped by a passer-by to pet the little cuties.